DALLAS – Russell Westbrook slalomed left around a screen and then jerked right back towards the middle of the lane. His stride long and his arms reaching out, Westbrook finished his glide to the rim with a marvelous layup, plus the foul. His free throw gave the Thunder a lead with 38 seconds to go in overtime, and it turned out to be the decisive bucket in an absolutely gut-wrenching 111-110 victory over the Dallas Mavericks. Just about every play leading up to, and after Westbrook’s basket had the air of a potential game-winner. In fact, the Thunder nearly had one at the end of regulation, when the Thunder grabbed three offensive rebounds on the same possession and came away with a Carmelo Anthony bully ball post-up, go-ahead layup with 1:23 to go. No one scored for the ensuing 82 seconds, but just before the final buzzer expired, Mavericks center Dwight Powell put back a missed runner on a scramble play to send the game to overtime. In the extra period, the Thunder and Dallas traded baskets for the first 3-and-a-half minutes, then again, the scoring ground to a halt as the defenses bunkered down for closing time. After Westbrook’s clutch driving layup, Paul George squared up against Harrison Barnes on the left wing. It was a gut check moment, and the Thunder’s Defensive Player of the Year candidate leveled his chest to the driving attempt and forced Barnes to barrel right into him, drawing a charge with just 32.5 seconds left. After a Thunder turnover on the ensuing possession, one of 22 in the game for Oklahoma City, the Mavericks had a chance again to end the overtime period with a basket, except this time it would have been a game-winner. After Westbrook smartly took a foul with 6.1 seconds left, the Thunder switched the action out front and center Steven Adams stayed with J.J. Barea long enough to cut off his attempted drive. Westbrook came over to help and as Barea passed to Dennis Smith Jr. in the corner, George converged to contest. Smith’s shot flew long over the rim, and the Thunder moved to 36-27. Adams’ presence defensively in the game was only matched by what he did on the glass. He finished with 12 rebounds, but nine of them were on the offensive end, part of a plus-20 effort by the Thunder in the rebounding column and a 25-10 edge in second chance points. 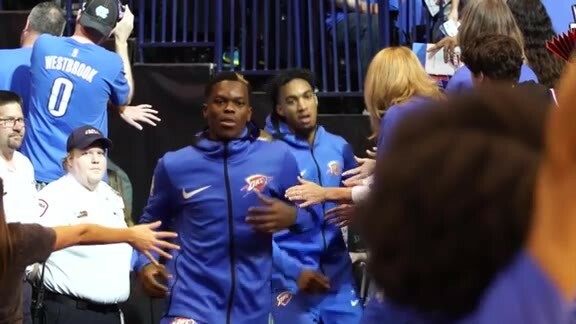 The backbreaking sequence towards the end of the fourth quarter that resulted in Anthony’s layup was a perfect example of what Adams was able to provide the Thunder throughout the evening. As Oklahoma City’s shooting percentage dipped as the game progressed, those extra chances Adams picked up helped the Thunder keep pace. After jumping out to a 32-21 lead by the end of the first quarter, fueled by a 15-0 run midway through the opening frame, the Thunder began to lose grip a bit during the second quarter and then were jumped on to start the second half. Coming out strong in the third quarter is a major focus for this team coming down the stretch of the season, so the Thunder will look to learn from that period tonight. Dallas outscored the Thunder 33-23 in the third, due to 7 Oklahoma City turnovers and 15-for-23 shooting by the Mavericks. The Thunder had a hard time controlling Powell in the pick and roll as he dove to the rim for lobs over the top of the defense. Partially, the Thunder’s defensive struggles in the period, allowing 18 points in the paint, was a result of a lack of pace on offense and the 12 points off turnovers the Mavericks were able to rack up.